This Real Photo postcard of Memorial Heights Methodist Church is much newer than most postcards we write about. Although we found it in the Special Collections at the Augustana College Library, it was originally mailed in 1959 by Don Wright with the message, “Your photos are in.” Mr. Wright operated a photography shop at 1605 Second Avenue, and, almost certainly, created this and other rare photo postcards of local buildings. 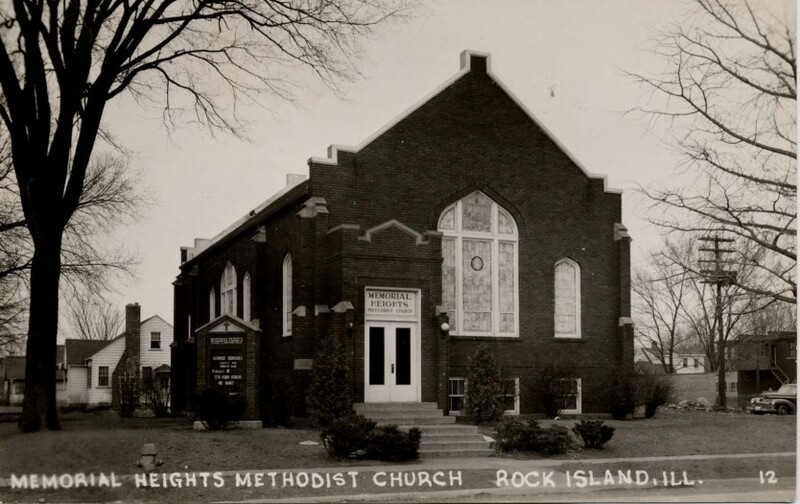 The Memorial Heights congregation was only 10 years old in 1959, although its roots can be traced to 1900 when Spencer Memorial Methodist Church was formed to serve the east end of Rock Island. That name was adopted in honor of Rev Wm. A. Spencer, native Rock Islander and a son of Judge John Spencer, a pioneer settler. In September 1907, its imposing red brick church at 7th Avenue and 43rd Street was dedicated. It still stands today. The hilltop congregation adopted the name Centenary Methodist Church in honor of the Centenary Movement, which celebrated 100 years of the Methodist denomination in America. A parsonage, visible behind the church on the postcard, was built first and was used as a temporary meeting place. By 1920, plans were being made for the new church building shown on the postcard. Aided by a $24,000 gift from the national Centenary Fund and land donated by First Methodist Church, the new brick-veneer church soon became a reality. Describing its August 13, 1922 dedication, the Argus called it “one of the prettiest for its size in the community.” A photo shows it appearing just like our postcard. It was small, only 35 x 56 feet, but it had a finished basement with 9-foot ceilings that held classrooms, a kitchen, and the boiler room. The main floor consisted of the auditorium, pastor’s study, choir loft, a small room for meetings and, behind the pulpit, the Epworth League room. The Epworth League is the Methodist youth organization. The 75 member congregation was still being served by a part-time pastor from Wesley Methodist in Moline, but soon requested their own resident pastor. Memorial Heights did enlarge their building at least twice, but without the old Spencer windows which remain in their original place. The first addition after the merger extended the church to the east, while the second addition extended to the north, where the parsonage had been located. In 1970, a newspaper drawing provided by local architects Lundeen and Toline show the proposed second addition. This $156,000 educational wing was mostly glass in the International Style. However what was ultimately built was a traditional design in brick that echoed the form and materials of the original church, especially in the triangular stepped parapet at the rooftop. Improvements to the church have continued over the years. A new $17,000 Saville organ was installed in 1975 and new stained glass windows were incorporated into the additions in the 1980s. Although it has been greatly enlarged and its large opalescent glass front window has been covered, the original Memorial Heights Methodist church was recognizable for its lifetime. One major difference iwas noticeable: The large yard at the left, 38th Street side, of the church on our postcard was lost to street widening in the intervening years. In 2006, the congregation made a decision to sell their historic building. This happened quickly, demolition followed, and a new strip mall replaced the church. This article, by Diane Oestreich, is slightly modified from the original, which appeared in the Rock Island Argus and Moline Dispatch on December 7, 2003.